Used similar product and Storm product compares well. The tape is very resilient and stays in place through many games. I use thumb slide and the tape still stays in place. What is the width of the tape. 1/4", 1/2" or larger? Hello! The width of the tape is actually 1". 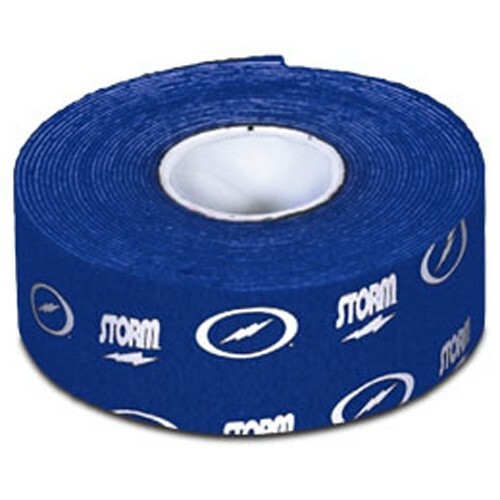 Thunder Tape: I use blue, love it. Are the black-blue-red versions all the same width and thickness? Hi Rich. The tape will be the same width and thickness, but not the same texture. Do you have the green tape. At this time, Storm only offers red, black, and blue. These are sold by the roll, and you either cut or tear the pieces off. The dimensions are 8 Ft. X 16 Ft. Sorry that is not correct. The measurement is 1 Inch x 16 Ft.
Due to the time it takes to produce the Storm Thunder Tape - Single Roll Blue ball it will ship in immediately. We cannot ship this ball outside the United States.